The humble spud, native to South America, has been cultivated and eaten for centuries the world over. It’s a capsule full of goodness, nutrition and energy and is filling enough to have as a meal on its own, yet subtle enough to be combined with just about anything. Growing your own organic potato crop is easy and rewarding and a fun way to also involve and interest kids in gardening – they will simply love digging out their very own baby tats! We say organic, because that is the most ideal way to grow them as they tend to absorb chemicals, if applied, which reduces their nutritional value. Potatoes are grown from seed potatoes, which will be available at Lifestyle Home Garden from the end of August when days get warmer. These are certified and disease free and will produce the best crop. They might appear wrinkly and dried up, but that’s quite normal. Before planting it’s important to expose the seed potatoes to some light (not direct sunlight) to encourage the eyes (little marks on the tuber) to start sprouting. This is called ‘chitting’. Very often this happens naturally on the shelves here at Lifestyle while they’re waiting for eager gardeners to scoop them up. Start planting your potatoes at the beginning of September when days start warming up. 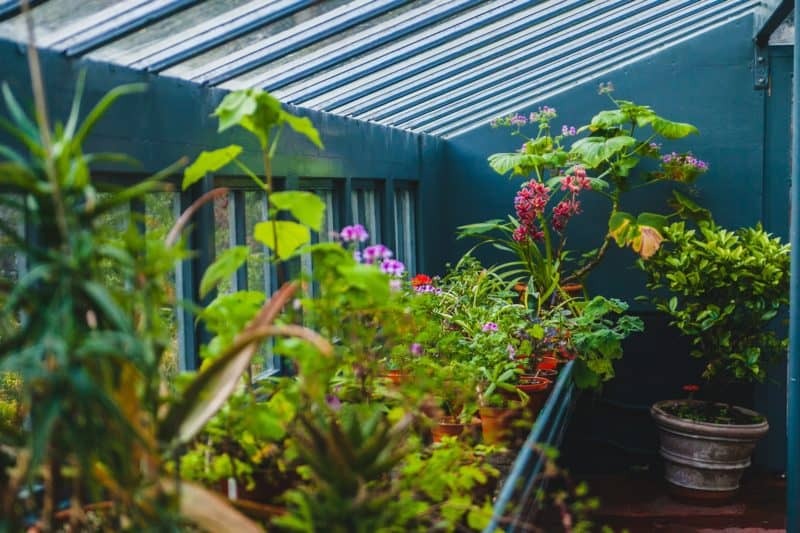 If you’re lucky enough to have a hot house you could plant an extra early crop and simply keep the containers in the hot house until all danger of frost is over and then move the containers to a sunny spot. Another crop of potatoes can be planted in late summer for harvesting into winter. The good news is you don’t necessarily need a large vegetable patch to grow your own. They can be grown in furrows in the vegetable patch, scattered throughout your ornamentals or neatly contained on a sunny balcony or patio as long as their basic needs are seen to. Choose a position in full sun and dig the soil over deeply, removing all stones and clods. Ensure that the soil is light, well drained and friable. Add plenty of compost and an organic 2:3:2 fertiliser or vermicast (Fertilis or Nutricast) according to directions. Chemical fertlisers can potentially burn the seed potatoes. You can now either plant the seed potatoes in holes, 10cm deep and 30cm apart, or dig trenches to plant them in. Trenches should be about 15cm deep and 35cm wide. If digging more than one trench they should be 45-60cm apart. Trenches should run from north to south to ensure that all the plants get their fair share of sunlight throughout the day. 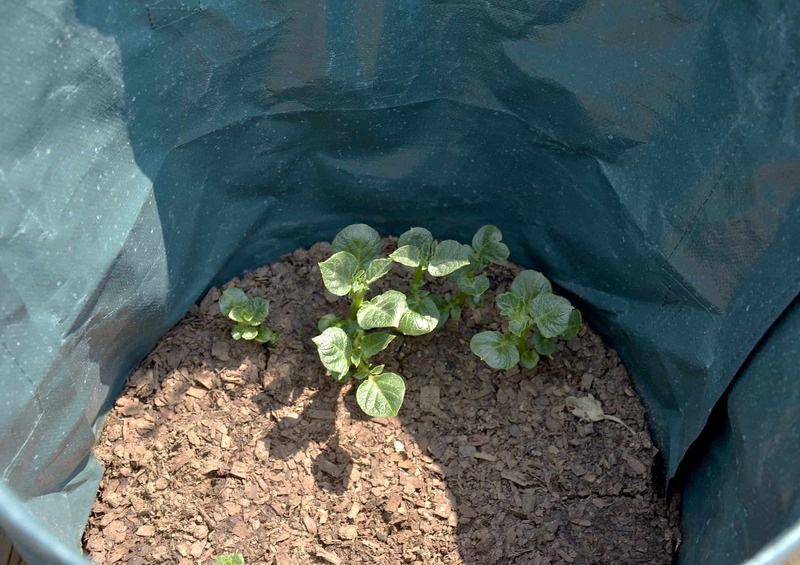 Plant your seed potatoes about 30cm apart along the trenches with the sprouts facing upwards. Cover with the excavated soil. Water thoroughly twice a week. 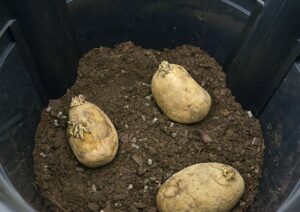 The potatoes will start showing themselves above ground after about 2 weeks. As soon as the sprouts reach a height of about 25cm, draw the soil up around them to cover the stems up to 20cm. New tubers will grow from these stems and it’s important to cover the stems to prevent tubers from going green. Repeat this every week as the plants grow bigger for the first 4-5weeks, and then leave the shoots to develop leaves. Continue to water the plants regularly. The soil should remain damp, but not waterlogged. An organic 3:1:5 fertiliser should be applied at this point. 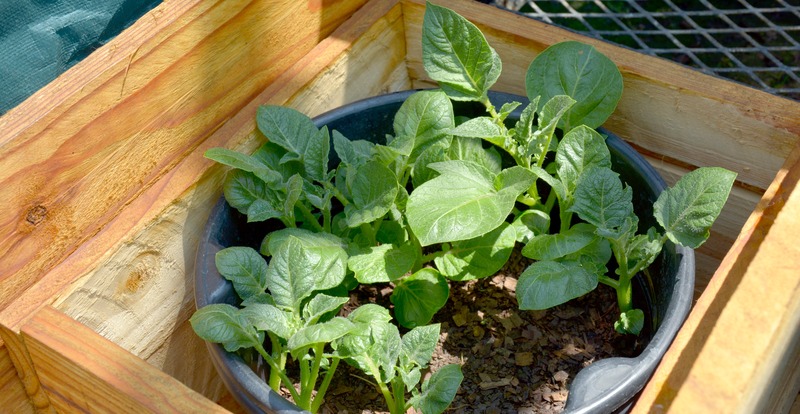 Instead of digging trenches, simply place the potatoes, sprouts up, in a hollow in the soil or on a layer of newspapers or cardboard and cover with a 20-30cm high layer of compost and mulch. Keep well watered and, following the same principles as above, keep adding layers of mulch and compost as the plants start growing through. Ensure that the tubers are always well covered. Green potatoes should be discarded and not cooked, as they are poisonous. A container of about 50cm deep is required for planting potatoes. 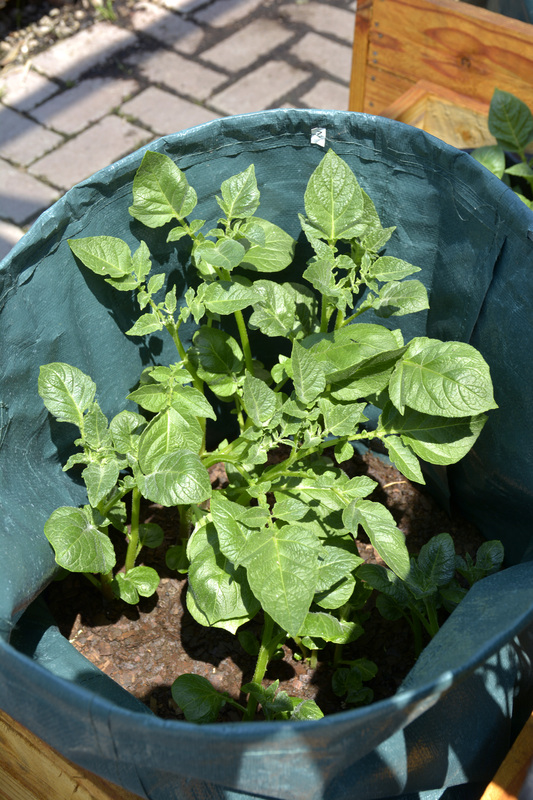 Easy options are large shrub pots or the handy Potato Bags available at Lifestyle Home Garden. It is very important that your container of choice has adequate drainage holes. Black planting bags will also do. Using stacks of old tyres are not advisable as they can leach heavy metals, which will be absorbed by the always hungry potato. Spread a 15cm layer of compost and potting soil, enriched with an organic 2:3:2 fertiliser and/or vermicast (Fertilis or Nutricast) at the bottom of the container. Place your seed potatoes on this layer with the sprouts facing up and cover with a 10cm layer of potting soil. Water well. 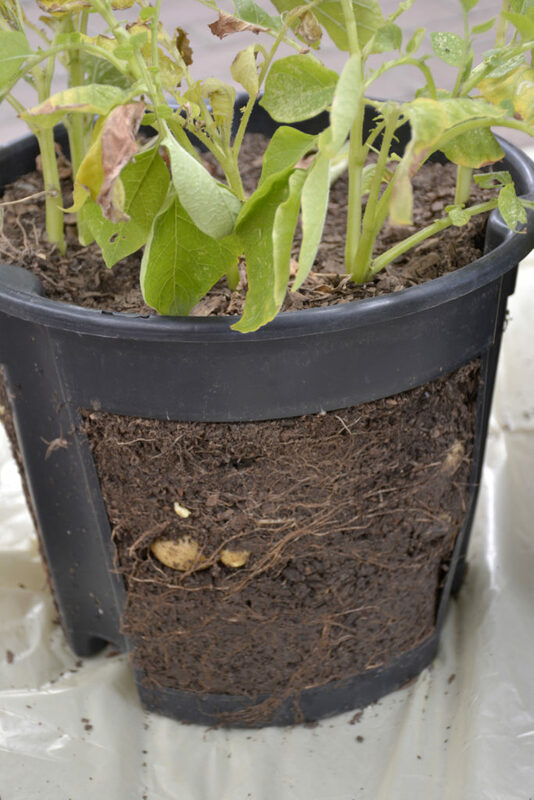 As before, keep covering the stems as they grow through the soil for the next 4-5 weeks or until your container is full. Keep moist. After ±8 weeks (depending on the variety) your potato plants will start to flower. If preferred, you can harvest 2-3 weeks after flowering for a crop of baby potatoes – a firm favourite with the kids! 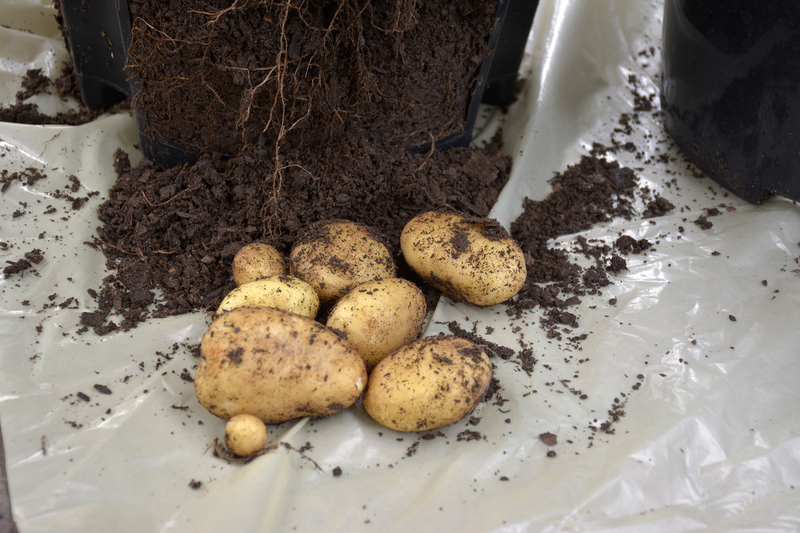 Alternatively or for part of your crop, you could wait until 2-3 weeks after the foliage has withered and died and harvest bigger, mature potatoes. Potatoes in trenches can be harvested by digging in a short distance from the plant with a 4 pronged fork and tilting the soil to lift the whole plant. 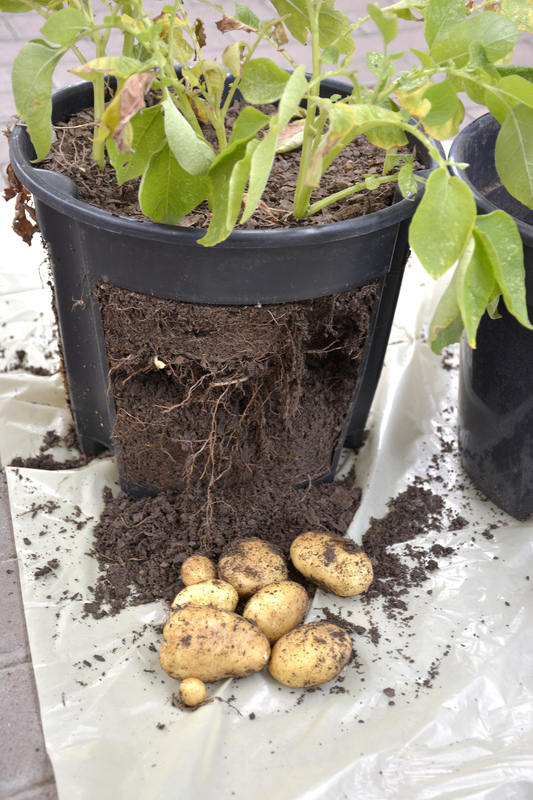 Remove all tubers from the plant and check the surrounding soil for more. 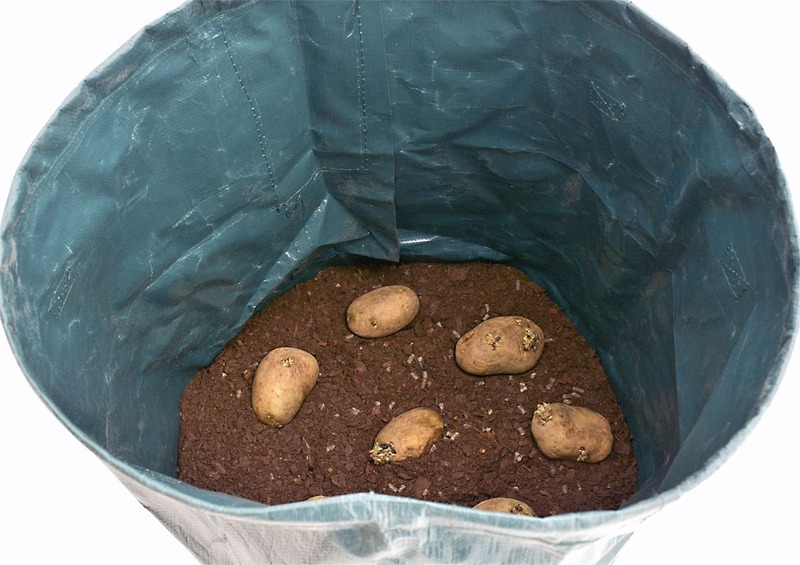 No dig potatoes can be retrieved by flattening the heaps and potatoes in containers can simply be poured out and scooped up. After harvesting, allow the skins to dry out and then store the potatoes in a dark, dry place. Potato beetle – regularly check the undersides of leaves, where for yellow eggs or orange larvae. These can be manually removed and crushed. In case of a severe infestation, use an organic insecticide. Fungus / Powdery mildew on the leaves. Avoid spraying water on the leaves as this can be a cause. Treat with an organic fungicide like Copper Count or Biogrow Copper Soap. Slugs and nematodes – see companion plants below. Plant a row of Mustard and/or Petunias near the potatoes as to serve as tonic. Marigolds will guard against nematodes and slugs. Marigold flowers and leaves can be added to the layers of soil that you build up. Horseradish, mealies, beans, strawberries, green peppers, Nasturtiums, yarrow and mint are all good companions and planting caraway or dill near potatoes will improve their flavour. Potatoes dislike growing near raspberries, cucurbits, tomatoes, onions, asparagus, sunflowers and celery. Never plant a new crop of potatoes in the same place twice in a season in beds or pots where other members of the Solanum family (tomatoes, brinjals and peppers) were grown.